Overview The Baader Mark V Großfeld (wide field) Binocular Head is an accessory that provides a more comfortable view for an observer by permitting experienced or inexperienced observers the comfort of viewing simultaneously with both eyes. It takes the light coming from a telescope and then splits it in about equal portions, then moves the light cone out and up into the human eye. The images seen in this binocular viewer can be breath taking, producing a view that is unrivaled by other similar binocular viewers in terms of contrast, clarity, and uniform distribution of light. But the most mesmerizing aspect of this device is how the objects observed often appear quite "three dimensional". The binocular viewer is particularly desirable for observing the planets, moon, and sun (with a telescope suitably equipped), and depending on the qualities of the telescope for observing some of the brighter "deep sky" objects. We have been surprised how many owners of "light buckets" are adapting their telescopes to reach focus with the Binocular Head. Right: the business end of the Baader Mark V Binocular Head shown here with optional Carl Zeiss Abbe Orthoscopic 16mm eyepieces (86,195 bytes). Click on image to see a higher quality, enlarged view (184,336). Origin of the Mark V The binocular viewer which the Baader Mark V improves upon was one of the few which were engineered for astronomy from the ground up; most other prior models having been adapted from microscopes and those were not all that successful. The Mark V system was engineered and first manufactured entirely in house by the most capable optics house in the world under their trade mark Carl Zeiss of Germany; one can see one of these in the museum collection of Company Seven's showroom. Since the reunification of East and West Germany, the 1990's brought about some reorganization at Carl Zeiss and the production of amateur oriented telescopes was suspended. Baader Planetarium of Mammendorf, Germany arranged to buy the castings used by Zeiss, then contract Zeiss to make the optics in what would be basically the same Baader Binocular Viewer. In the USA this prior model and its current successor described herein are sold by and Astro-Physics and by their only full line retailer Company Seven. The Baader Binocular Head as provided by us includes a number of options that can be ordered separately. This includes the Baader Planetarium T-2 90 Degree Prism Mirror commonly known as a diagonal prism in the USA. The Baader T-2 Maxbright is a ruggedly constructed, all metal modular component where an adapter is needed for the incoming as well as the outgoing aspects. And so we also provide a 2 inch male nosepiece machined by Astro-Physics, this is antireflection machined and finished and it accepts thread in 48mm filters. And to permit the quick installation or removal of the Baader Mark V Head we include the Baader T2i Quick Change Adapter, with Zeiss micro bayonet female mount. Above: Baader Mark V Binocular Head with provided Baader 90 Degree Angled Zenith Prism (98,956 bytes). Click on image to see a higher quality, enlarged view (153,175). Left: to better understand the numerous possible viewing attachments and how they go together with the Baader Mark V Binocular Head to use the head with a variety of telescopes click on the icon at left to download the drawing (121,856 bytes in Adobe .pdf). 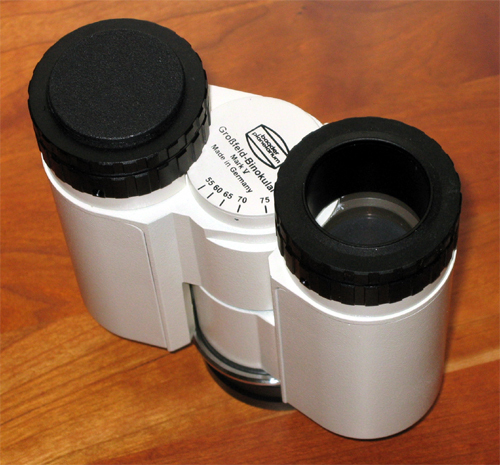 Eyepieces (in matched pairs): the TeleVue 19mm or 24mm Panoptic series eyepieces have been the particular favorites of our binocular viewer customers. Note that the 24mm Panoptics have a Field Stop diameter of 27.14 mm as measured by us, this is wider than almost every other 1.25 inch ocular! 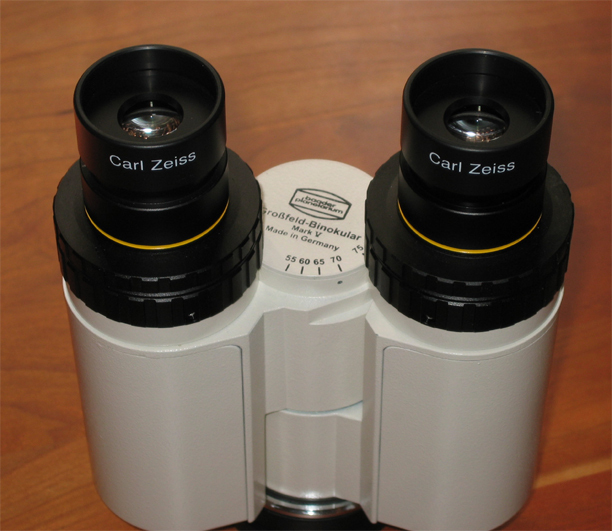 For higher magnification applications we generally suggest you consider the Carl Zeiss Abbe Orthoscopic, TeleVue Radians, Astro-Physics Super Planetary Series Eyepieces. You may do best to call us and discuss your particular requirements. Color Filters: 48mm thread in filters will be available from Baader Planetarium and other premium makers at Company Seven. These will be optically polished as are the Moon & Skyglowfilters. Note, however we do not recommend using 1.25" eyepiece filters on each eyepiece since they will add additional length to the eyepiece barrel and require additional backfocus so they may not work with some telescopes. Backfocus (also refered to as in-travel) is the difference between where the light focuses and the back of the focuser needs to be. The back focus requirements will vary depending upon your configuration. Please note that this viewer may not reach focus with some instruments, including some earlier models of our refractors. Determine the back focus of your instrument by measuring the distance from the 2" opening of your scope to the focus point. 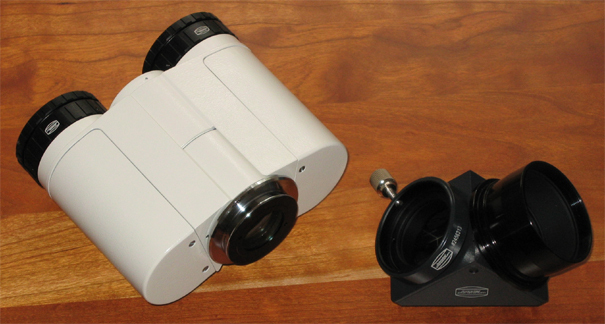 Right: the business end of the Baader Mark V Binocular Head shown here with one eyepiece port cap on, the other port open (74,688 bytes). Click on image to see a higher quality, enlarged view (189,706). This premium accessory is distributed only direct from Baader Planetarium in Europe, with sales in the Americas by Astro-Physics and Company Seven. You may see a unit on display at Company Seven. These are time consuming, costly items to make with demand historically outstripping supply. Once you enter our special order list, plan to wait anywhere from six months to a year or more to receive your new Mark V Binocular Head; it is never likely that these will become "off the shelf" inventory. Company Seven is accepting orders for future delivery and you may refer to our on line price list for current prices. We are giving some priority to those whom we know will appreciate them most, and we will not accept orders from those who have demonstrated a penchant for "scalping" products at inflated prices on the resale market. It is best to protect Binocular Viewers from shock, vibration, dust and dirt. When not in use, store in a padded case. Keep the provided lens and eyepiece port covers in place. Do not pack it into an airtight container or store it away with covers on when wet (from dew, etc.) for long periods of time. Before storing for an extended time let it "dry out", and then store it in an air conditioned room ideally alongside desiccant in order to reduce the potential for contamination or the development of fungus. Do not ever disassemble a Binocular Head. Draw any loose bits of foreign matter from the exposed lens surfaces with an air bulb or small vacuum. Stubborn particles may be removed with a soft camel's hair brush such as the Staticmaster which we stock. To remove contaminants such as finger prints or eyelash oils, place a few drops of an approved lens cleaning solution such as those made by Kodak, Zeiss, etc. onto a natural cotton swab. Make certain the swab is damp but not dripping wet. Then gently wipe the lens surface in a circular motion with little or no pressure, surface adhesion should do. Although these optics incorporate durable anti reflection coatings coatings, they can be damaged by hard rubbing if tiny abrasive dirt particles are pressed accross the glass. You may follow with a wipe using a distilled water wetted swab or tissue. You may arrange to have Company Seven clean any SPL (or other optic) we sold for little or no fee.